We will be staying at the Disney's Coronado Springs Resort and we have a block of rooms reserved for the event. You may book your rooms using our group rate after you have signed up for the event on or after Feb 25th. Group rate is good 3 days before and up to 3 days after the event. Check-in time is after 3:00 p.m. Check-out time is before 11:00 a.m.
Room rates are subject to applicable sales and resort taxes, currently 12½%. Subject to availability of group rate rooms, run of house rooms at the Hotel may be reserved at your Group Room Rates for the three days before July 1, 2011 and the three days after July 5, 2011 (for attendees wishing to extend their stays). 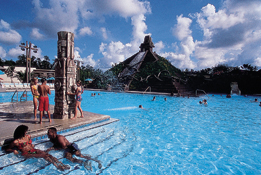 Disney's Coronado Springs Resort's main pool, themed as a large archeological-dig site, is built around a five-story Mayan temple called Pyramid of the Sun, and includes a slide and waterfalls that cascade into an outdoor splash pool. Three remaining pools are designated quiet pools. There's also a 22-person spa tub. Pool towels are complimentary. The resort surrounds a 15-acre lake, and a nature trail weaves its way through the woodlands surrounding the resort. Bikes and watercraft are available at the marina. Children enjoy the large playground, separate children's pool, and two video arcades. And a sand volleyball court is located on the lakefront beach. In addition, there is a full-service health club on site with Cybex aerobic and exercise machines, a sauna, and massage therapy. Disney's Blizzard Beach Water Park is located within minutes (one mile) of the resort via complimentary shuttle to Walt Disney World® Resort. The resort's guest service desk can also assist guests with reservations on any one of Disney's five tour-caliber golf courses, all located on Walt Disney World® Resort property. A 9-hole walking course is available as well. Attendees will pay for their own room, taxes and incidental charges in accordance with applicable Disney's Coronado Springs Resort's policy in effect at the time of our event. Attendees will be subject to the Hotel's credit policies and procedures for guests at that time. Disney's Coronado Springs Resort currently accepts the following credit cards from attendees: VISA, American Express, MasterCard, Diners Club Card, Discover Card and JCB Card (Japanese Credit Bureau). Individual room reservations must be confirmed and guaranteed with a deposit of one night's room revenue, plus applicable taxes. Should an individual cancel a reservation, refund of the deposit will be in accordance with the Hotel’s general policy (currently a refund is given if the reservation is canceled at least five days before arrival).